The main concern here is if the younger demographic will latch on to it, giving it more momentum after its initial three days. With Jay-Z’s help in the music department and its true nature to the book, I think Luhrmann will have a hit on his hands, despite the film’s flaws. This is not the first time someone has tried to adapt Gatsby into a film. There was a 1926 silent version, a 1949 version directed by Elliot Nugent (My Favorite Brunette), the 1974 flick with Robert Redford, and the 2000 television movie that starred Paul Rudd. The latter two I have seen, and while I enjoyed some of the performances, all came up weak in the end. Now we have Luhrmann, who seemed to Fitzgerald’s novel into his own ‘Moulin Rouge‘ and give it a good wash. With its large 3D visuals, the techno-inspired epic parties, and soundtrack by Jay-Z, Jack White, and Beyonce might strike a bitter chord with fans of the novel, but rest assured, Luhrmann stays fairly faithful to the book. Gatsby starts off in a grainy black and white screen with some dull music rolling out during the opening graphics, which morph into a highly colorful 3D graphic as if the theatre curtains were being drawn up to show us that green light from the end of Daisy’s pier. We cut to Nick Carraway (Tobey Maguire) who is in a therapist’s office and is trying to tell him what went down in the summer of 1922 when he lived in West Egg, New York. As he begins, there is a montage of scenes of New York being built and the city’s successes and declines. The archival footage mixed with the CG footage looks great with an impressive look at 1922 New York City. I’ve only seen one other film that matched this detailed look of the Big Apple and that was Peter Jackson’s ‘King Kong‘. Nick was a young graduate of Yale and wanted to try his hand on Wall Street. He moved into a small house smashed in between two large mansions, which are river front properties. Across the river is his old Yale buddy Tom Buchanan (Joel Edgerton) and his wife and cousin of Tom, Daisy (Carey Mulligan). Meanwhile, one of Nick’s wealthy neighbors is the reclusive and impressive Jay Gatsby who throws excessive and high-priced parties almost every night where politicians, gangsters, celebrities, and socialites show up. However, none of them actually know Gatsby or have even seen him before. It’s not even until 35 minutes into the film where we get our first glimpse of Gatsby (Leonardo DiCaprio) where is his entrance and introduction is brilliant. He simply owns the world with his smile and confidence. Meanwhile, on the other side of the lake, Daisy is still longing after her long lost love Gatsby whom she had seen five years ago before he left for the war, and while away, she married Tom, who to put it lightly is a pompous bully. But with a few “Old Sport” names shouted out, Nick and Gatsby become friends and eventually Gatsby tells him about Daisy and their love. Gatsby even asks Tom to set up a surprise afternoon tea with Daisy, which is one of my favorite scenes in the film. DiCaprio really puts his heart on his sleeve and leaves his soul out to be embraced or rejected by Daisy, and DiCaprio’s performance as he is awkwardly trying to talk and move around his love he hasn’t seen for many years should win him an Oscar. It was so endearing to watch coming from a person like Gatsby. Meanwhile, during the affair of Gatsby and Daisy, Tom is having an affair of his own with Myrtle (Isla Fisher), the local wife of a man who runs a down and out garage on the outskirts of town. 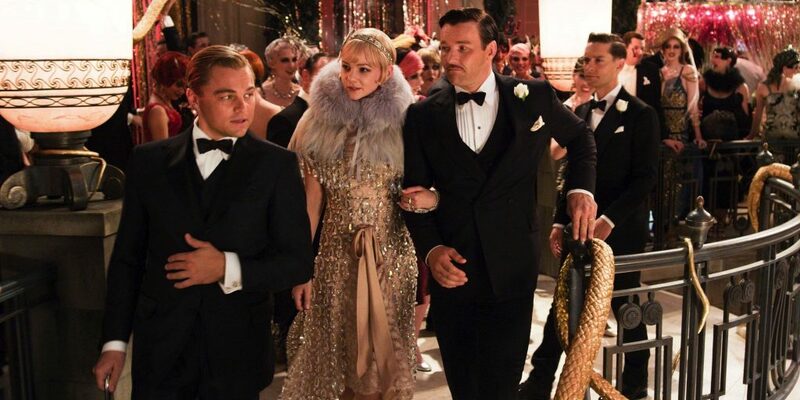 And their friend Jordan (Elizabeth Debiki), a golf pro and socialite tries to keep Daisy happy and Tom unaware of what is transpiring until everyone ends up at the Plaza Hotel, spilling their guts about their feelings, which leads to car wreck and then to Gatsby’s pool, which might be the best shot scene in the movie. Luhrmann really slows things down after an hour into the film so we can see Gatsby’s love for Daisy grow and grow as he tries to recreate their passion from when they first met, even though Nick tells him that he can’t repeat the past, to which Gatsby informs him that he is wrong. It’s here where we lose Nick in the story as he only serves to narrate from time to time and becomes a bit tedious as the other characters are far more interesting. Maguire does a great job as Nick as far as it can go, being that he is more of a fly on the wall and sides with Gatsby throughout, even though he might not have in the book. Edgerton plays a mean Tom to a tee. You hate the guy, but that’s a good thing and gives an amazing performance. Fisher and Debiki turn in sold performances as well when they are on screen. Mulligan is charged with the difficult task of Daisy. Daisy is different for everyone. She is the American dream girl, which could be bad or good for some people. She does an okay job here, but felt like I wanted more from her, as she seemed to tone down her role a bit, which left her relationship with Gatsby something less than desired. The one that truly shines above the rest is DiCaprio. He is Jay Gatsby. His persona, charm, and character are flawless. He is truly larger than life here and is one of the best parts of the film. Every time he is off-screen, you want him back on-screen.The picture itself is incredible with it’s detailed sets, lavish parties, and amazing costumes. The film itself is also in 3D, which I found less than thrilling. Sure, there is an added depth, but it was unnecessary and I feel brought you out of the story and character. The only thing I could come up with as to why this was 3D, was to make more money and attract a younger audience. I think the story itself could do just fine without the added effect.With Luhrmann’s beautiful direction and Jay-Z’s music contribution, which is a breath of fresh air and I think coincided with Fitzgerald’s love of modern music, ‘The Great Gatsby‘ is worth seeing and might just be the best adaptation yet of the iconic novel. Video: ‘The Great Gatsby‘ comes with two options. One disc has the 4K UHD version with a HEVC/H.265 encoded 2160p transfer and is presented in 2.40:1 aspect ratio. The other disc has the standard 2D Blu-ray version, which has a 1080p HD transfer and presented in 2.40:1 aspect ratio. For this particular review, I will talk about the 4K UHD version only, which is definitely an improvement on the standard Blu-ray version. Needless to say, this 4K UHD Disc is just about everything you’d want in this upgraded format and is the only way to watch this movie, despite a few minor issues. The clarity and detail is impressive with every tiny stitch in the time period costumes showing up nicely. The way they look with all of their nuanced colors changing in the different lighting and fireworks look amazing. Details in the makeup, individual hairs on the actor’s faces and background objects in the mansion look magnificent. You’ll be able to distinguish every tiny detail. Colors are bright, bold, and simply pop off screen, and even change during the many well-lit sequences throughout the film. The black levels are deep and inky and the skin tones are natural. There were some instances of video noise here and there with some different fluctuations in grain, as well as some shadow crush, but overall, this image is a high improvement on the previous standard Blu-ray release. Audio: I’ not sure why Warner Bros. didn’t add a Dolby Atmos track to this release like they usually do with their other 4K UHD titles, but they didn’t here. It would have been amazing to hear the new mix with all of the cars bustling in and out, the party scenes, and the excellent music throughout. Still, we get a great lossless DTS-HD 5.1 mix that is fully immersive. Sound effects and ambient noises are excellent and full at all times with great directionality. The dialogue is always crystal clear and easy to follow without any pops, cracks, hiss, or shrills. The bass kicks into high gear too without crossing into rocky territory during the big music sequences, leaving this audio presentation with great marks. The Greatness of Gatsby (HD, 9 Mins.) – Baz Luhrmann talks about how he came aboard the project and casting Leo DiCaprio and Tobey Maguire who both add their thoughts on the film with some on-set footage thrown in. Within and Without with Tobey Maguire (HD, 9 Mins.) – Tobey Maguire had a camera on set and filmed a ton of fun things, including on-set footage, gags, jokes, dancing, and more. The Swinging Sounds of Gatsby (HD, 12 Mins.) – Baz Luhrmann, Jay-Z, and more discuss the music of the film. The Jazz Age (HD, 16 Mins.) – This is awesome, where the old Jazz legends from the 20s and 30s are talked about here and how society and jazz came together. Razzle Dazzle: The Fashion of the ’20s (HD, 16 Mins.) – Production Designer Catherine Martin talks about what inspired her to create the wardrobe for the film and how much work into making each costume. 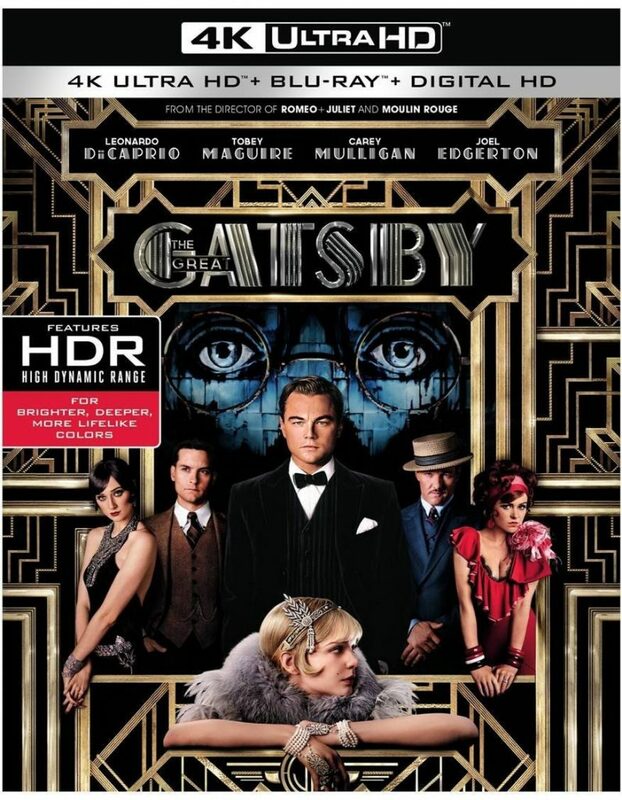 Gatsby Revealed (HD, 30 Mins) – This bonus features has five segments that discuss five different big and important scenes. The themes, adaptation from the book, execution, and difficulties are explained here in regards to setting up the shots and creating the image and sets. Deleted Scenes (HD, 14 Mins.) – There are two deleted scenes, plus an alternate ending here, all of which are fairly short. Baz Luhrmann discusses why everything is cut in great length. Theatrical Trailer (HD, 1 Min.) – This is a trailer for the first adaptation of the film from 1926, which is awesome. There are no known prints to exist of this 1926 film, so this trailer is the only known thing to be around. This version of ‘The Great Gatsby’ is phenomenal. Baz Luhrmann’s theatrical sets and filmmaking make this modern version very appealing and visual eye candy. The performances are excellent all around and the music is insanely good. The 4K UHD is the BEST way to watch this movie hands down. You also get the standard Blu-ray version as well as the Digital Download. The video and audio presentations are both top notch and there is a wealth of extras, all of which are worth watching. This entry was posted on Tuesday, October 25th, 2016 at 10:57 am	and is filed under Film, News. You can follow any responses to this entry through the RSS 2.0 feed. You can skip to the end and leave a response. Pinging is currently not allowed.